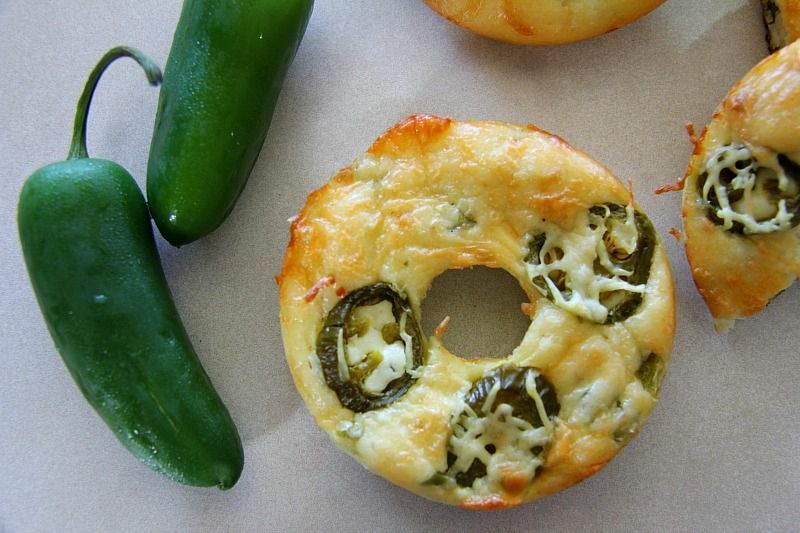 These low carb bagels are flavoured with spicy jalapeno and topped with cheese. 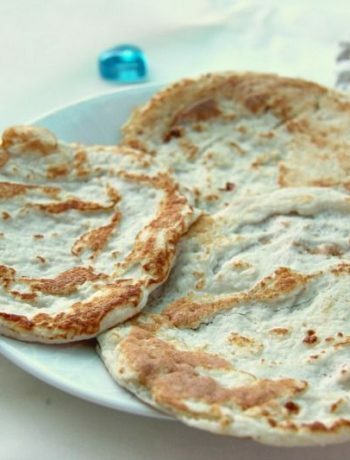 As it is baked with a variation of the Fathead Dough it is a cheesy, low carb delight. I’ve been enjoying playing around with the Fathead dough recipe and when I tried the bagel recipe from the talented Maya at Wholesome Yum, I became a bagel addict. They were so delicious that I ate them every day for a week and wondered if it was possible to live off them? So, inspired by this new addiction, I thought that I would add a flavour combination that I find delicious. 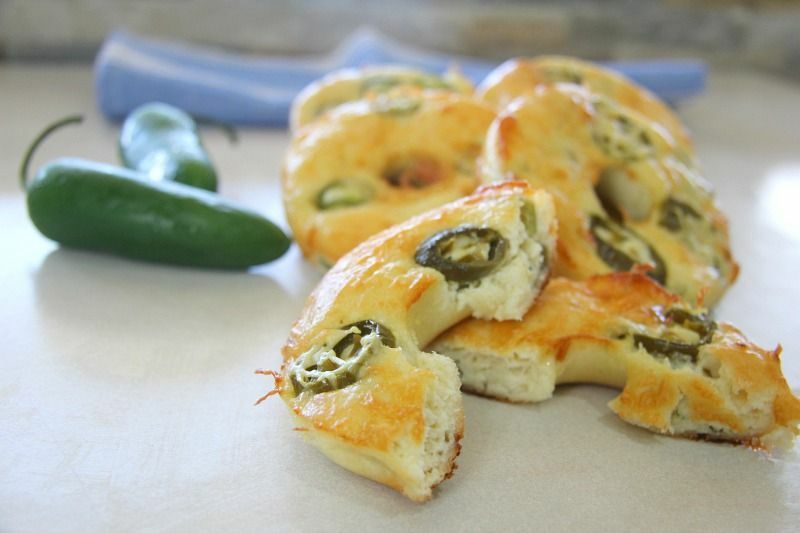 Jalapeno and cheese. There’s one supermarket in St Lucia that sells jalapeno pepper and I stock up like they are on sale when I see them. 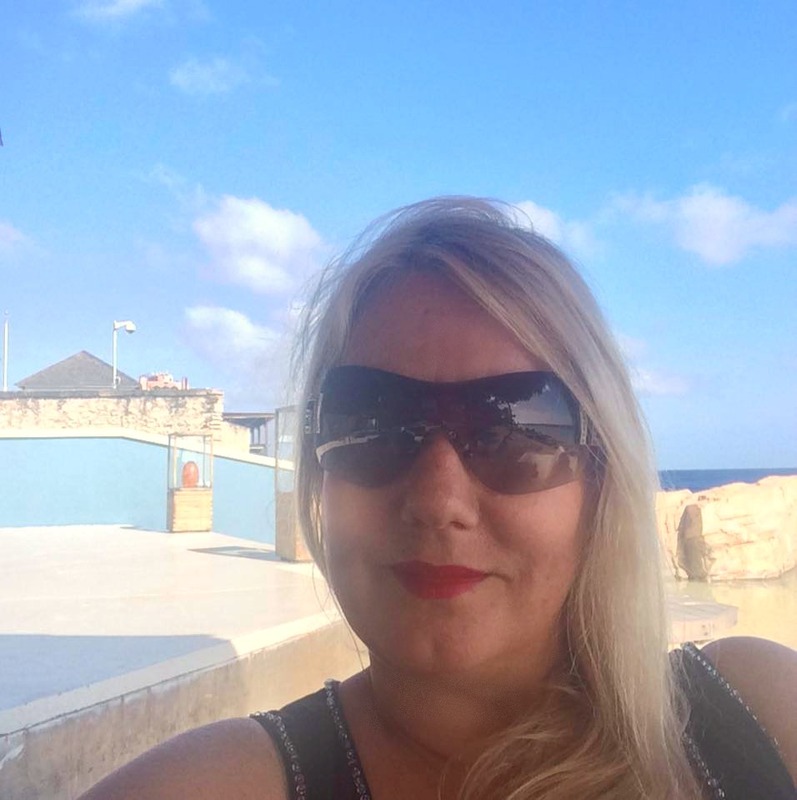 Island shopping is like that. You cannot always be guaranteed that what you see will still be there next week. Items that you take for granted in the USA or Europe, such as zucchinis, are not a regular item. So, when you see them, regardless of any recipe planning, you buy them. You buy them all!! 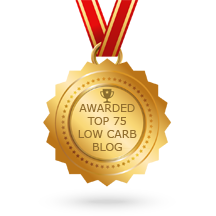 I made four batches under the guise of “I’m not sure, maybe the next batch will be better” as I loved these delicious low carb bagels. The oven we have is the strangest we have ever had. It’s a gas oven with a bizarre temperature on it so some of my baking time is now guess work. I know what temperature works for most recipes but sometimes my oven works as it should, sometimes it decides that the baking with take longer. Good times. The first batch was made once again, without writing down the recipe. Or if I did, I threw the paper out. Eventually I was happiest with the last batch and could hit “publish”. 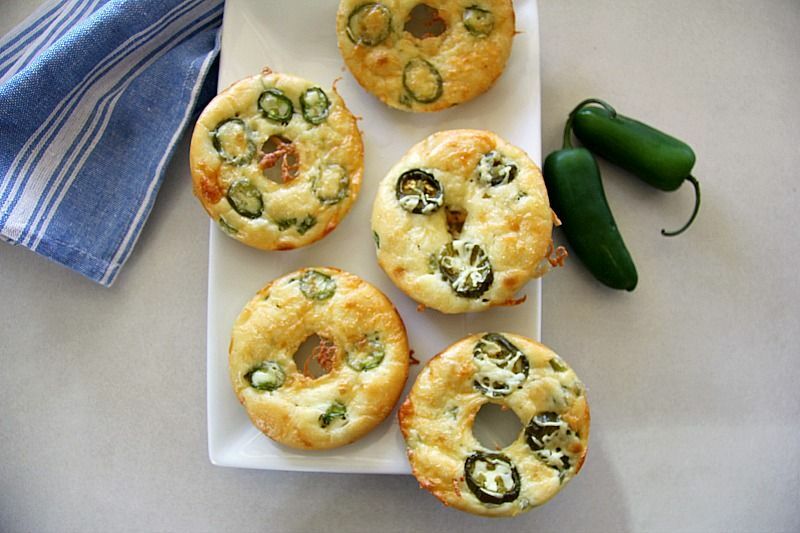 When making these low carb bagels, you need to move like a mixing ninja in the kitchen. Make sure that you have the almond flour mixture prepared and ready to go. All the trimmings should be on standby as you are going to have to mix fast and furious once that mozzarella has melted! 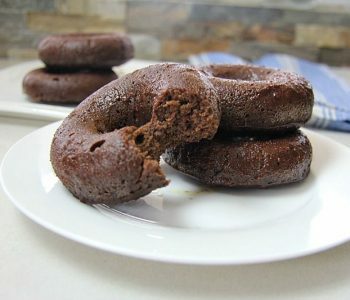 I used a donut tray to bake these to keep their shape and volume. I’ve found that when I bake Fathead bagels they can deflate a bit, making it hard to slice. Another kitchen ninja tip is throw those empty bowls into soak as soon as you can. Dried Mozzarella on the bowls is not the easiest of things to get off. I used sliced jalapeno peppers from a jar for one batch. 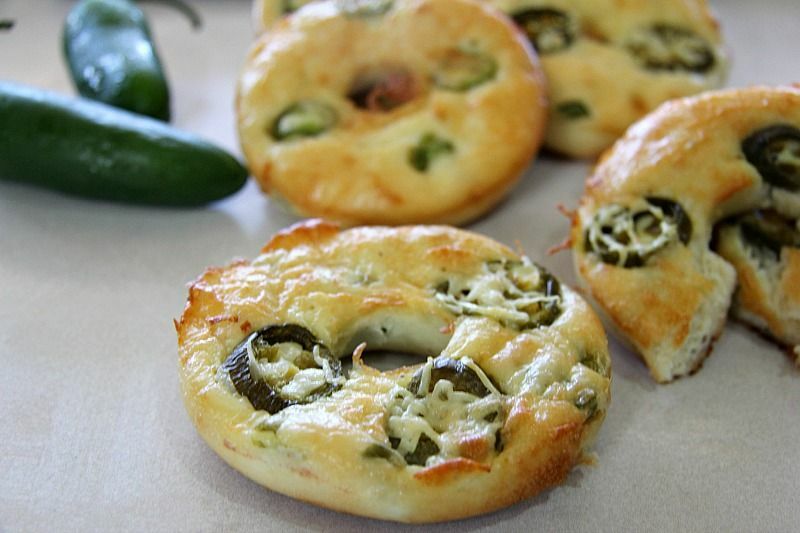 I loved that batch of low carb bagels experiment, but it may have been the extra salty taste of the jalapenos that I enjoyed. I suspect that I would be a person who would enjoy pickle juice from the jar. 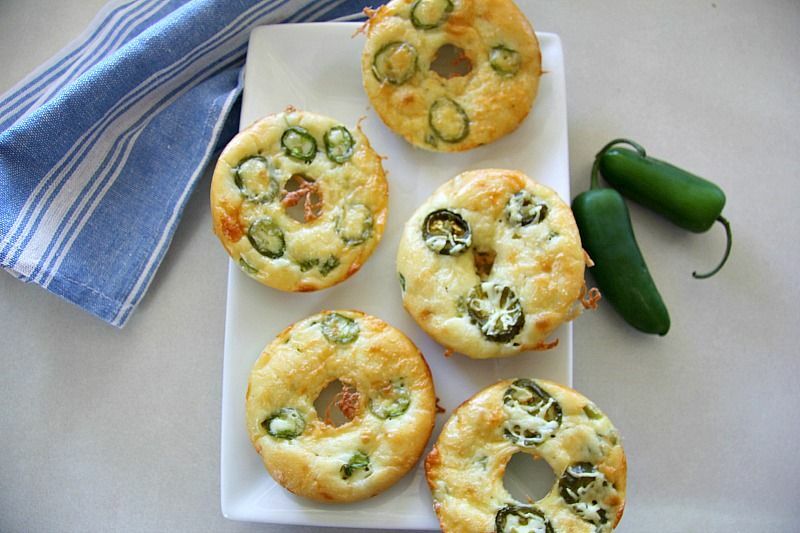 These jalapeno low carb bagels keep well in the fridge for the next day. 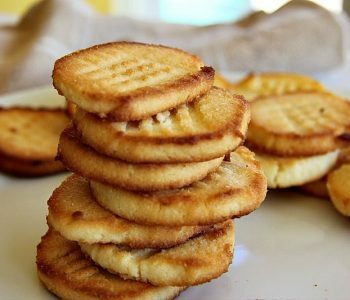 They will harden slightly because of the cheese but pop them in the microwave for a few seconds to refresh them. Or slice and toast them! Either way, it’s a delicious breakfast! Chop and deseed the jalapeno peppers. Slice a few thin circles and set them aside for the decoration. In a bowl, mix the almond flour and baking powder. Add the chopped jalapeno peppers and eggs. Mix well. In another bowl add the mozzarella and cream cheese. Cook in the microwave for 2 minutes, stopping after 1 minute to give it a gentle stir (you’ll end up with crispy bits around the bowl otherwise). Remove and stir, then add in the almond flour mixture. Stir well and combine until you have a blended dough. 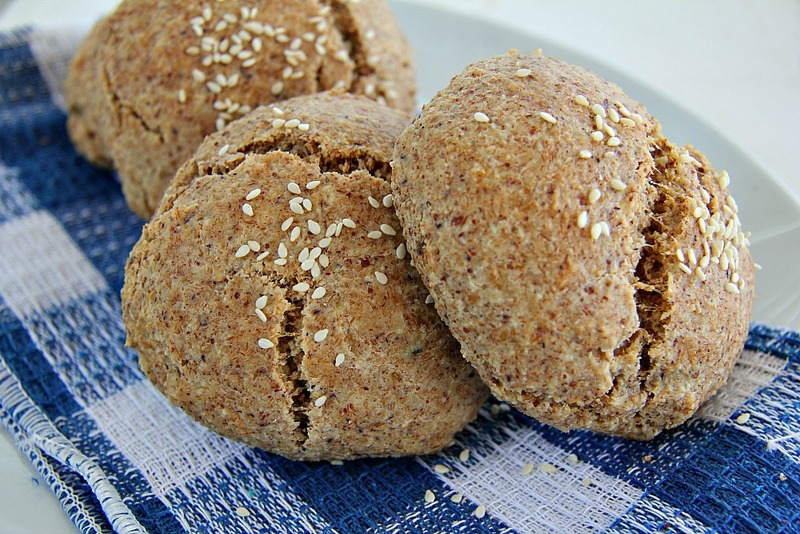 Break the dough up into 6 pieces and roll out the pieces to make into a bagel shape OR use a donut tray to place the dough in. (I find this easier to keep them neater). 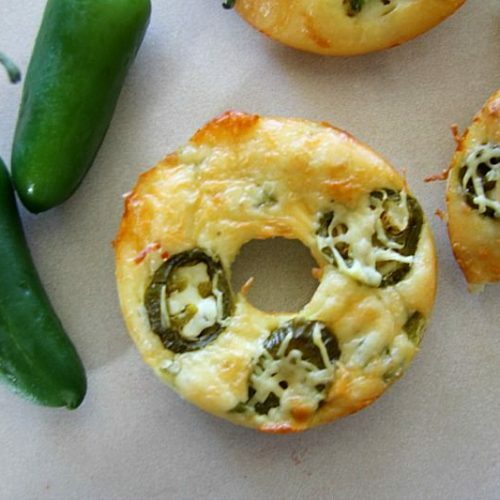 Decorate the bagels with sliced jalapenos and sprinkle with some grated Cheddar cheese. Bake for 20-30 minutes, keeping an eye on them that they bake until golden. This has become my favorite pizza crust. Growing up in Michigan we love a thicker crust and this is just perfect in a 12 x 9 cookie sheet. It’s so, so good. Love the bagels too, made them several times before I realized how good the “bread” part would be as crust. 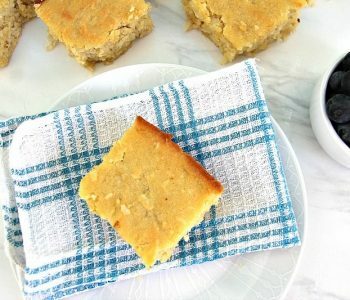 I make this recipe all the time, and now my mom does too. Glad you like it! Love the idea of using this for a pizza crust too! Hi Angela. Can you clarify the net carbs calculation? 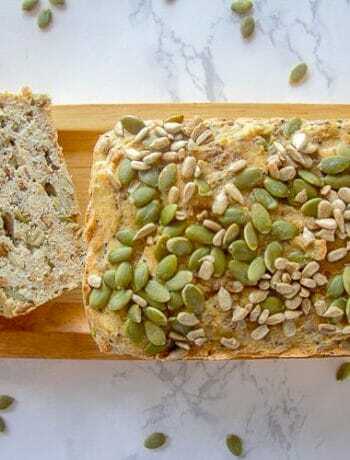 The recipe notes indicates a different result the nutrition facts due to 2 different entries for the dietary fiber. Is this 2 or 4 net carbs? 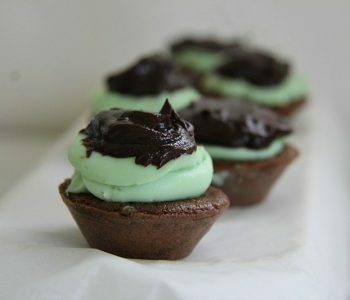 Looks delicious & will make them this weekend! I don’t know to be honest as I’ve not tried it. 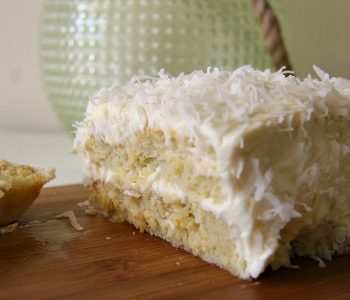 Hi Angela … is it possible to let me know how much coconut flour I can use as a substitute for almond flour. If this is possible can you also let me know the changes to the other ingredients. Hope this isn’t a big ask as I really love using coconut flour. Thanks so much. I made these today. Unfortunately I don’t have a bagel tray and they came out round and not quite as flat as a biscuit. But they were amazing. I spread cream cheese on a warm one and it was probably the best Loire carb recipe I have ever had. I froze the remainder and will enjoy each day. Thanks. Glad you liked them! I’ve made them without a tray too and also found them a bit flat, but hey, they tasted good anyway!